Michael Clarke, the Australian cricketer is one of the finest all rounder in cricket of all the time with captain of current Australian team in both One Day Internationals and Test matches. On 2nd April of 1981 he was born in Liverpool Australia and got married in 2012 to Kyly Clarke. Michael has played so many matches under local cricket team of New South Wales and also Sydney Thunder. After showing amazing performances with both ball and bat he got chance in Australian national cricket team and since then he never looked back and now his years of International experience is used for the sake of his country. 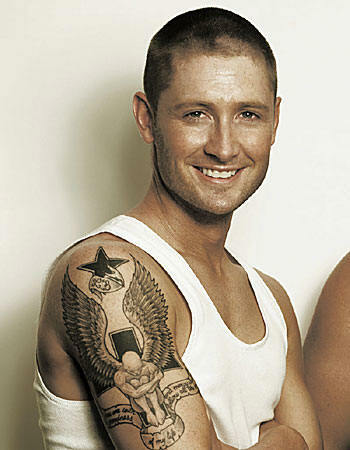 Even before entering to International cricket, Michael has been very fond of interesting tattoos to wear on his body. Once he had tattoos having initials of a bride Lara bingle etching as his shoulder tattoo. In August, he had a big tattoo showing a guardian angel which is sitting on the cross having written L.B. on its top. During an underwear campaign of Bonds, he had worn tattoos all over his body which he revealed to the photographers. With the other Bonds such as Pat Rafter, Pup, he showed off his new wonderful tattoo which covered almost full of his right arm’s upper side. After showing his tattoos during 2006, Clarke mentioned he likes tattoo a lot and promised to add even more collection to his body art. He also said that he wears only those tattoos which have some meaning within it.